I liked 2 well enough. More than the first entry and its respective remake. I can't articulate why I liked it, but it didn't seem downright offensive in any regard. In spite of FOEs not giving out EXP I never felt under the level-curve and I liked its encouraged party synergy of MURDER DEATH KILL with the Ronin in the front line and the Hexer in the backline. It was cheesy, but it sure as hell felt more satisfying that EO-vanilla's TURTLE TURTLE strat of First Turn > Immunize, rinse and repeat. Although I do recall some of the FOE movement patterns to be overly asinine/puzzely. IIRC, Untold 2 is fairly decent and feels a lot like what EO2 and Untold 1 should've been. But nobody played it. EO3 is forever my favorite, because I more or less have become burnt out of the franchise after that point. I've yet to 100% it. Probably never will. I only came 99.9% of the way to 100%'ing EO-vanilla which damn-near broke me. (Was only missing one item drop.) I haven't bothered with EO post-game content ever since and I haven't looked back. I picked up Untold 1 instead of 2 because I had never played the first game. I only made it through the first stratum before getting bored. Maybe I should get EOU2? I still have to get EOV too. If nothing else EOU2's protagonist has a Devil Trigger and he's got a radical anime theme to accompany it. I'd actually play the Story mode for that one, instead of outright ignoring it in EOU1 because the cast was so incredibly whitebread generic. The story mode in Untold 2 was Pretty All Right. The story in Untold 1 wasn’t all that impressive, with only the extra maps and boss fights to recommend it, but Untold 2 has some good character bits and even a decent plot twist or two. And yeah, maybe it doesn't need an Untold remake. This is going to be officially unveiled next week, on the 10th, during a livestream. Man, I still haven't finished EOV. I've been picking away at it in 15 minute chunks for months now and I'm only nearing the end of the 4th stratum. I kind of hope EOVI takes a while to make it to North America, because I won't be ready for another one of these games for a little while. If we're being totally honest, I don't know if I'll ever be ready for more - I've made a hell of a lot of maps over the years. Man, I still haven't finished EOIV or V.
This is probably going to be an unpopular opinion around here, but I'd just skip IV. And maybe V, if the new one seems like it's going to come out reasonably soon. I like V better than IV, but it's not essential. I would definitely disagree; IV is still probably the best one. IV is one of my all time favorite games. I haven't picked up V yet, but I enjoyed the demo well enough. I'm already grinding my teeth with dread over whether it will come out here. Keep on trucking, 3DS! At least until I have this game. 4 and 5 are both very good EO titles. My only gripe with 4 is that the class selection is too limited, especially early on, and my only gripe with 5 is that there isn't more to do. Following a teaser late last week, Atlus has announced Etrian Odyssey X for Nintendo 3DS. The game is set to release on August 2 in Japan, and the official website has been updated. Many classes from previous titles in the series will be available, with 19 in total. 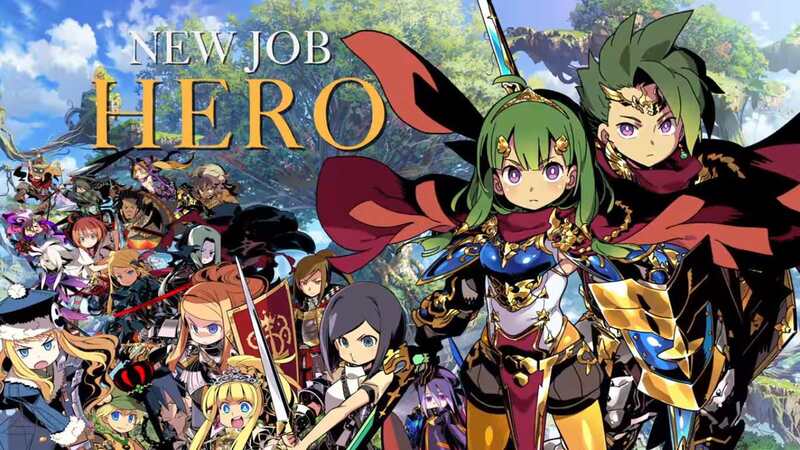 Etrian Odyssey X also has a new job titled "Hero". Additionally, the Break/Boost system from Etrian Odyssey 2 Untold seems to be making a return, as well as the expanded character creator from Etrian Odyssey V. You can also select from portrait artwork used in previous games. Atlus also touts that Etrian Odyssey X will feature the largest number of maps in the series. More information will come in this week's Famitsu magazine. It remains to be seen if Atlus USA will localize this title. It's worth noting that Etrian Odyssey V launched in English more than a year after its Japanese release, and Etrian Mystery Dungeon 2 released in Japan last year with no localization announcement as of yet. So it is quite literally the Monster Hunter X of the series? Would be kinda funny if they localized it as Etrian Odyssey Generations but they'd probably just stick with the X or come up with something entirely new. Anyways sounds about right for one final farewell to a dedicated touch screen for mapping. Oh god, all those classes. Picking a team will be a nightmare of choice. Did I just see a world map allowing you to travel to the setting of every previous game in that ridiculous trailer? You'll never, ever stop building your party! There's a few that I'm sad to not see, like Dancer and Sniper/Arbalist. I guess they at least included Shogun as an alternate tank option, but I would have liked to see Dragoon as well since that makes for a pretty good mix of possible tanks (standard front-line tank, DPS tank, and rear-line ranged tank even if summons are not going to be a thing in X). But regardless, that is a really strong pool of classes, and with sub-classing the possibilities are incredible. Also I'm really happy they made sure to pick Imperial, because that was one of the best classes from 4. I hope we get to pick Imperial right off the bat this time since I always wanted to use it in IV but didn't want to play catch up. With subclassing this game is going to be insane and no doubt the easiest to exploit. But damn. What a swansong. Pugilist is the right choice from EOV but I would really have liked to see Necromancer in there, too. And WTF, no Dancer? They were the best part of EOIV! I'm 100% here for Sovereign/Princess/Prince. They made EO3 for me and are my favorite way to keep your party healed by someone who's not actually a dedicated healer in any RPG, much less EO. The rest is just gravy. I really need to finish EO5 before this comes out (and it better come out in America, dang it)! Omitting the dancer mightve been to keep the game from being completely broken. But hell, I would've liked it too. Do we know the source of this list? "From reddit" doesn't exactly inspire confidence. I'm guessing it's just naming all the classes in that picture Sprite posted? I spot several classes in there I recognize (such as Princess!). The press release says there are 19 classes, and the trailer has pictures of 19 classes. Dancers will be missed, but then again, I can still play EOIV, and 19 classes seems like way more than enough.